A Freddie Mercury tribute act has narrowly escaped jail after he raced against his friend down a busy road at over 80 miles per hour. The 'Qween' frontman Craig Duggan, and his accomplice Stephen Douglas raced down the A184, near Gateshead in a high speed game of cat and mouse. Douglas, 29, was in a black Subaru hatchback when he tailgated as close as four metres behind 46 year-old-Duggan's black Mini whilst travelling at a dangerously fast pace. Neil Pallister, prosecuting, told the court how a witness saw the pair overtake her, then overtake six or seven others whilst weaving in and out of lanes, before slamming on their brakes at a set of lights. He said: "The witness said that she heard the tyres screech as they zoomed off when the lights turned green. "It is clear that the pair were racing as the events unfolded." Duggan, of Joicey Street, Pelaw, then collided with the back of a lorry, and the Subaru smashed straight into the Mini on July 16 last year. Douglas' car skidded across the road and into a barrier, taking down a road sign in the process. Witnesses heard a loud bang as the collision took place - one described them both as "a pair of nutters". Duggan's lawyer Mr Thomas Finch said: "He is a lead singer in a Queen tribute band and he has been doing a lot of work for charity. "Although he did commit the act, it was completely out of character. "He has raised thousands of pounds for charity." Douglas' lawyer Mr Graeme Cook added: "My client will have to take the extended driving test before going back to work." The pair both pleaded guilty to a charge of dangerous driving. Duggan has a previous conviction of driving whilst disqualified in 1994, but since has had no other offences - however Douglas has 51 previous convictions including aggravated vehicle taking, dangerous driving and driving whilst disqualified. 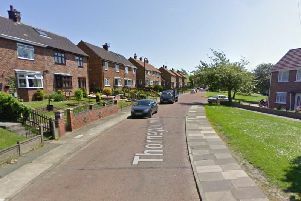 Douglas, of Amy Street, Southwick, Sunderland was given a 13 month sentence suspended for two years, along with a 20 day driving rehabilitation course because of his previous history. Duggan was handed a smaller sentence of 12 months suspended for two years. The pair were both ordered to do 200 hours unpaid work, pay £650 in prosecution costs, and they are disqualified from driving for 12 months. Mr Recorder Mark McKone said: "Dangerous driving can lead to people being killed and is very serious indeed. "The road was busy and you were driving at 80 miles an hour at only one car length away from each other." He added: "You (Douglas) have no respect of road traffic laws, but have had no offences since 2010. "Mr Duggan, you do a lot of work with charity and it is important that you stay in work."